ISA deadline day  5th April - is fast approaching and, with interest rates desperately failing to keep pace with inflation since 2008, there is speculation that many people will be shunning cash ISAs in search of the highest returns they can find from a stocks and shares ISA. The average interest rate on cash ISAs stood at a meagre 1.18% at the start of March 2014, according to Bank of England figures. That's well below inflation, which has been riding high above the Bank's target of 2% for much of the last five years, meaning savers have effectively seen the value of their hard-earned money fall in real terms. 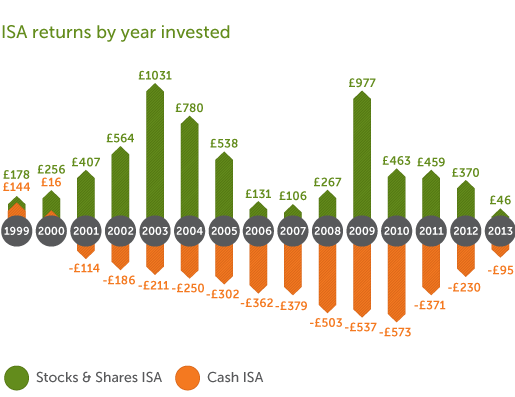 Nick Hungerford, founder and CEO of online investment manager Nutmeg, believes we're about to see a significant swing from cash ISAs to stocks and shares ISAs. So where does that leave anyone looking to find the best returns from an ISA, or exploring investment ISAs for the first time? There are plenty of ‘do-it-yourself' platforms out there where you buy access to them and have the opportunity to invest in one or more of the funds they recommend. But how do you know what funds or individual shares will perform best? Just picking from a short list of suggested funds, or buying into particular stocks and shares someone has suggested to you, can put you on very dangerous ground, says Hungerford. Getting a complete, diversified portfolio like that, fully managed by an investment team, is not something that comes easily unless you have a lot of money to invest. Or is it? Recent regulatory changes in the investment industry have led to the emergence of companies like Nutmeg who can offer this kind of high-end service at low cost by taking advantage of the efficiencies and powerful tooling that digital technology gives you. The crucial question remains, however: What kind of returns can you get from having a diversified portfolio? Given that interest rates have remained so low for so long  in fact, the five-year stagnation we're currently experiencing is unprecedented since the post-war recovery period of the 1940s and 1950s  it's no surprise that the British public may finally be feeling the pinch as the cost of living far outstrips their capacity to save. That was perhaps the driving force behind the Government's recent announcement that they'll be revamping ISAs from 1st July, giving people more flexibility to switch between cash and stocks and shares ISAs, and increasing the total annual allowance to £15,000. The views and opinions expressed herein are for informational purposes only. They are subject to change without notice, and do not take into account the specific investment objectives, financial situation or individual needs of any particular person. They are not personal recommendations and should not be regarded as solicitations or offers to buy or sell any of the securities or instruments mentioned. The views are based on public information that Nutmeg considers reliable but does not represent that the information contained herein is accurate or complete. With investment comes risk. The price and value of investments mentioned and income arising from them may fluctuate and you may get back less than you invest. A movement in exchange rates may have a separate effect, unfavourable as well as favourable, on the gain or loss otherwise experienced on the investment concerned. Past performance is not an indicator of future results, and future returns are not guaranteed. We acknowledge an individual's tax situation is unique and tax legislation may be subject to change in the future. Nutmeg past performance simulated, based on real market transactions implemented across all individual customer portfolios to a single portfolio for each risk level. Past performance is not an indicator of future results, and future returns are not guaranteed.